For all you wannabe Air Cadets out there. Manningtree Sqn is now recruiting for new cadets. If you are in year 8 at school or below the age of 16, please come along and join a fantastic organisation. Worried about fitting in? 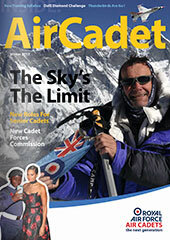 Equality is a central part of the Air Cadets’ ethic. The cadet experience is open to everyone, so whatever your nationality, background or ability, whether you’re male or female, if you’re in year 8 at school and below the age of 16, you can join us. The maximum age for entry is 16 years old, therefore you can request to join us up to your 16th birthday, although you can stay beyond 16 once you’ve joined. Contact us now, telephone 07702-232507 or use the form below. All of our squadrons welcome personal visits by potential cadets (ideally accompanied by a parent or guardian), during our Parade Night – Monday 19:00hrs to 21:30hrs. Some squadrons recruit throughout the year, others have specific entry dates. Contact: Tel 07702-232507 or use the form above. Our address is: 1334 Squadron Air Cadets, Drill Hall, Mill Lane, Manningtree, Essex CO11 1DQ.